You know that the lady in your life deserves something special on her birthday, and the perfect card will help you send the right message as she celebrates another year. 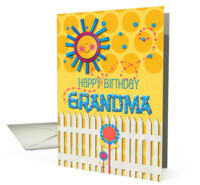 With over 1,300 birthday cards available in a variety of styles and layouts, the ideal birthday card for her is just a click away. 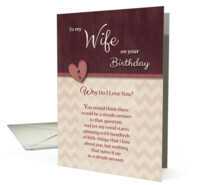 Whether you are searching for your wife, mother, sister or any other special lady, you're sure to put a smile on her face and a warmth in her heart with your unique greeting. To make it even easier for you to brighten her day, you can pick up your order at your local Target or we'll mail it the next business day. Inside Text: It’s your birthday! Shake things up!!! Artist Notes: a sweet, silly little birthday card. Inside Text: Happy Birthday, sweet cheeks! Artist Notes: Stop driving yourself crazy over finding that funniest birthday card. We got you covered with this McCoy Brothers cartoon that is guaranteed to crack a smile during anyone's birthday. Inside Text: Happy Birthday to a very special person! Inside Text: Another year in the bag. Happy Birthday! Artist Notes: Keep calm and buy this funny card from NobleWorks Cards! Artist Notes: What a nice way to wish a happy birthday and send your congratulations to a girl or woman on her special day. Pink polka dots with a flower to send your good wishes. Inside Text: ... may your day be as sweet and beautiful as a Spring garden! Happy Birthday to a Lovely Lady! Artist Notes: Summer gardens are so beautiful and this bouquet has been enhanced with a lovely pink soft vignette making it a perfect Birthday card for any female friend or family member. Inside Text: Happiness on Your Birthday and Always! Inside Text: Quit the chores and celebrate! Artist Notes: Don't waste your money on any other cards. Get this card from NobleWorks for your friend's birthday! Inside Text: Happy birthday to a "natural" beauty! Artist Notes: Shirley the turkey doesn't want to be rude, but she wonders if her peacock friend's had a little help from a bottle. Great way to wish anyone a happy birthday. Artist Notes: can be personalized JUST FOR YOU!! Inside Text: A special person, a special day, and that is why this comes your way. With warmest wishes for all the things a very happy birthday brings.! Artist Notes: A birthday greeting for someone special features a green and pink polka dot border. The center is white with a stick of birthday gifts, a piece of cake with candles and polka dot balloons. Inside Text: Wishing you a day filled with all things wonderful wrapped in love and laughter Enjoy! Inside Text: ~ Love those 29s ~ Wishing you the Happiest Birthday ever! Inside Text: You go, girl! Happy Birthday. Artist Notes: This vintage bad-girl card is the perfect birthday card! Only at NobleWorks. Inside Text: It’s your Birthday! For heaven sakes, lose the housework and live a little! Artist Notes: The pearly gates, death, dying, vacuum cleaner, cleanliness is next to godliness,, nature abhors the sound of a vacuum, birthday Thanks for checking out my greeting cards. More cards: http://www.greetingcarduniverse.com/community/store.asp?store_id=2337&gcu=42744787710&mid=cwu Search: "Cornered by Mike Baldwin+books" to see Cornered books on Amazon. Inside Text: Flowers and butterflies for a wonderful girl! Inside Text: Happy Birthday! Hope it’s a blast! 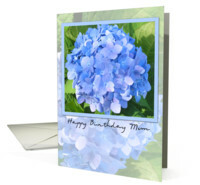 Artist Notes: Thanks for checking out my greeting cards. More cards: http://www.greetingcarduniverse.com/community/store.asp?store_id=2337&gcu=42744787710&mid=cwu Search: "Cornered by Mike Baldwin+books" to see Cornered books on Amazon. Inside Text: Yes, it’s all about YOU! Have a fantastic birthday! Artist Notes: It's All About You! A fun little birthday card. Please feel free to add to, or change the inside message to make this card your own. Inside Text: To wish to a very special person a very Happy Birthday! Artist Notes: A copy of an original oil painting of an adorable little girl picking flowers is on the front of this birthday card, suitable for a young girl or woman. Inside Text: Only the best of Birthdays will do for someone as sweet as you! Happy Birthday! Inside Text: Wishing you a day filled with make-believe and fairy wings! Inside Text: hoping your day is the sweetest most beary special day ever! Inside Text: Have a very special Happy Birthday! It’s your day to sing! Artist Notes: A very special hand painted birthday card. A time to sing a song of the birthday person! 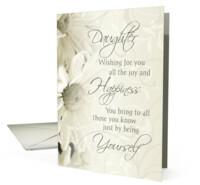 Inside Text: May you enjoy your Birthday in every Happy Way! Inside Text: Another birthday? Sweet. Artist Notes: Indulge with this clever card from NobleWorks and send it to your friend today. Inside Text: Celebrate disgracefully, the best of life is yet to be!